Log in to the transaction center. 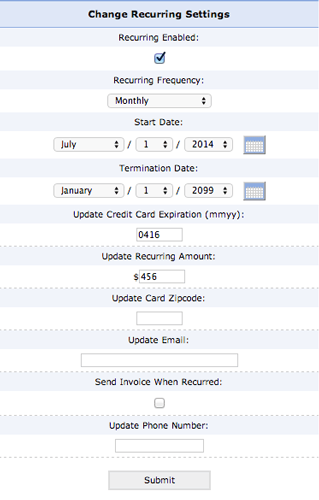 POST NOW: The actual recurring billing will run on the selected frequency for the date that it was authorized. Example: Entering in a transaction on 2/15/16 with a monthly recurring frequency will result in the recurring transaction running on 3/15/16. POST LATER: The recurring billing will run on the selected scheduled frequency on the date that was selected to be posted. Example: Entering in a transaction on 2/15/16 with a post later date of 2/20/16 with a monthly frequency will result in the recurring transaction running on 3/20/16 of the following month. 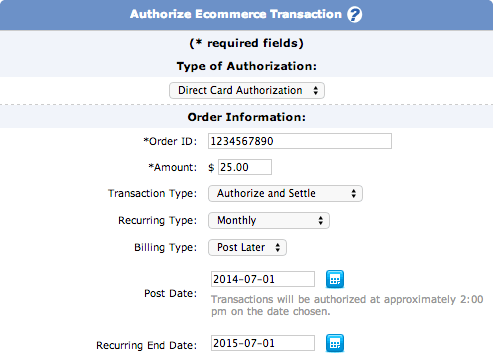 Search for the transaction by any preferred criteria or bypass all and click Begin Search. The next screen will show all transactions that match the search criteria. Click on the magnifying glass icon to the left of the recurring customer that needs to be revised. Changes can be made to enable, disable, change the frequency, dates or amounts. After the changes have been made, scroll to the bottom of the page and click submit. If a recurring billing transaction fails as a result of any type of decline, it will disable it from recurring billing and need to be enabled. To completely remove a recurring billing customer you will need to uncheck the 'recurring enabled' box and set the frequency to 'none'. Article written by Stacey D.